Braves and Padres played the last two games of this series in wildly different fashion, and because the Braves won the 3rd and final game of this series, breaking the 12 game losing streak we had in San Diego, I'll focus on that one more than the loss. Game 2 was your average, run of the mill blown save in the 9th. Vizzy came on in the 9th inning with a 1 run lead, and immediately gave up the tying homer to Derek Norris, before imploding even further with a walk, a wild pitch, and two more hits that eventually plated the winning walk-off run. The Braves pitched well enough in the game to win with Blair only going 4.1 innings and 2 earned runs, but I'm still very concerned about his ability to go deeper into games long-term. He's a young guy and he's already getting gassed in games with 86 pitches? He hasn't pitched well enough to be that fragile, or command that kind of bubble wrap treatment. Game 3 was the game where the Braves had the lead wire to wire. Julio was great again with 8 innings and 2 earned runs on 2 homers. That's Julio's only problem as I've said before, the homers. Luckily they were both solo shots and the Braves plated 4 runs of their own, courtesy of Freeman, Markakis, d'Arnaud, and Teheran himself. All had great RBI hits in a game where the Braves had a small village stranded on base. 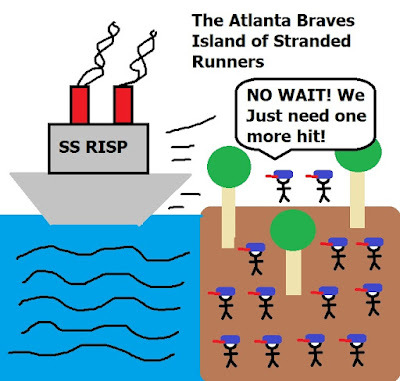 How many stranded runners? Try 13, and the Braves had 14 hits and 3 walks. It was insane at one point how they weren't winning by 8 runs, but they went 3-14 with RISP, which is becoming an ever increasing problem with the lineup. They've fallen now to a .236 average with RISP which is 24th in the MLB. Overall I'm just happy we didn't get skunked on the West Coast, which is a pretty low bar. But that's the bar we walk up to nightly and order shots of sadness from. And occasionally you get a fireball. And you like it. Hell, we're all just looking for a few bright spots right now, so we'll savor Wednesday night for two more days until the Braves take on the Cubs this weekend.